Like any other good manner or habit that you teach your kids, teaching them table manners also has equal importance. Good table manners reflect your effective parenting and help your child build a constructive image before others. 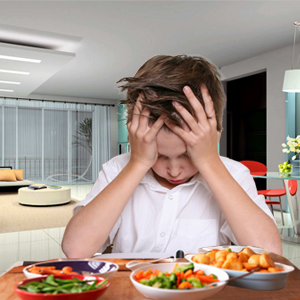 Most parents neglect this particular aspect reasoning that kids can eat the way they like when at home, and when dining out, they can be controlled via some little threats. 1. Being Clean & Tidy: Teach your child to wash his hands and face before coming to the dinner table. Maintaining cleanliness while eating not just shows respect to the food, to the one who cooked it but is also a vital hygiene habit. Eating with dirty hands or a shabby appearance hampers the child's as well as your image as a parent. So take great care of personal hygiene while eating. 2. Never Over Fill the Plate: A lot of grown up people can also be seen filling their plates more than what's required. Make sure you teach your child to let his plate be served with minimum amount of food so that he can eat it without creating any mess. When the plate is overly filled, chances are high of the food being dropped down by the kid. Teach them to play safe and ask for extra if there is a need. 3. Chew with the mouth shut: This one's very important, many kids chew the food with their mouth open which results in food pieces spilling down. It not just looks shabby but can be very annoying when you are eating out at a restaurant or at someone's place. Instruct them to chew with the mouth shut, this looks decent and the food is also chewed properly in this manner. 4. Hands or Spoon, eat the right way: In India we generally prefer eating with our hands. However, the trend is changing and people love eating with spoon, knife and fork. Well this depends on the type of cuisine. You can't eat chapati or naan with a spoon and nor can noodles be eaten using fingers. Teach your kids what food items can be eaten via hands and which all need spoon. And if he or she is comfortable with hands, see to it that they don't use both the hands as it again looks shabby. 5. No talking while eating: Dining table is meant for eating the food and you must avoid making it a conference table. This doesn't mean that you need to be silent while eating and act like a zombie. When we say no talking while eating, it means that kids must be encouraged not to talk while they have their food in the mouth. Also, the talk needs to be limited so that the concentration is completely on food and eating it in the right way. 6. Eat when all are served: When you are eating together, everyone must be involved unanimously. Teach your child to start eating only when everyone on the table has been served. If you are sitting in a restaurant and anyone is yet to get the order, advise the child to share food. This appears cordial and no one feels out of space. 7. Eat in small portion: Stuffing the mouth with food isn't counted among good table manners. And kids generally have the tendency of taking larger food bites. This not just makes them appear rather bizarre but even causes them some difficulty to chew. It is always better to eat smaller bites, wolfing down the food is not the right way to follow. 8. Asking is the right way: Kids can serve themselves but while doing so they might drop down some food and thus mess up the dining table. Advise them to ask rather than reaching out to things on their own. 9. No messing up with food: Many of the children love playing or fiddling with the food served on their plate. Often this results into a mess when the food falls down. Advise kids not to be playful while eating. 10. Be polite with the words: This is applicable when you are eating out at a restaurant. If your child is capable enough of ordering the food on his own, teach them that he should maintain eye contact with the waiter and order in a polite way. Also, once the ordered food is served, don't forget to say a humble thanks to the waiter.